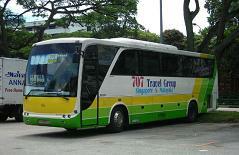 707 Travel Group is one of the most popular bus company providing express bus service from Melaka to Singapore and returned service from Singapore to Melaka. Over the years, 707 Travel Group has built up the brand to provide a balance in excellent service, price, and quality for coach service between Singapore and Melaka. 707 Travel Group coaches have a reputation of leaving and arriving on scheduled time so customer have peace of mind knowing the bus they are traveling in is punctual. In recent years, they have become the first choice for Malaccan who would like to travel from Malacca to Singapore as well as Singapore to Malacca. The arrival point for 707 Express in Singapore is at Queen Street bus terminal, which is conveniently located next Bugis MRT (about 5 minutes walking distance).